As most X100 owners know, there’s a degree of fashion and style associated with the pseudo-rangefinder. The camera is beautiful which encourages congruent accessories. 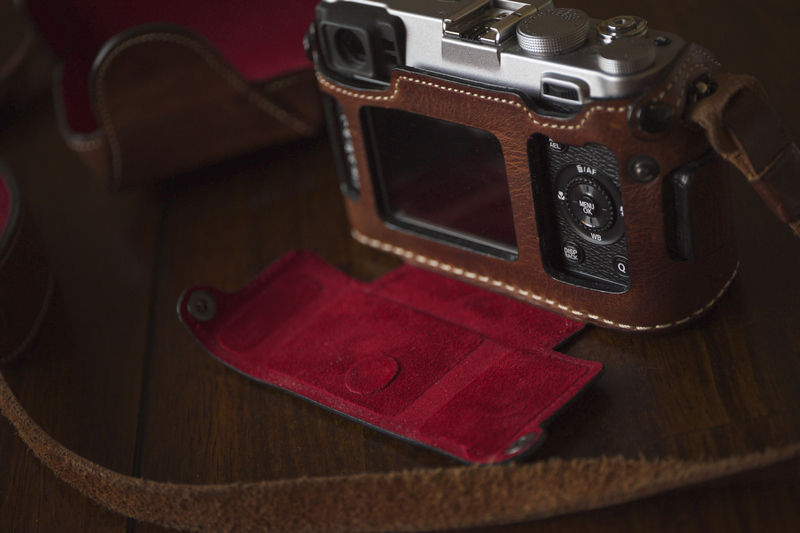 I purchased my original X100 with the genuine Fujifilm X100 Leather Case which fit well and worked fine. Unfortunately, one of my dogs decided the leather case would make a tasty chew toy and ruined it shortly after mating the camera to the case. The camera made it out without a scratch, but the case was rather off-putting. So my search for a new case began. I looked at some options such as the Gariz Half Case and the MegaGear Leather Case which appeared be a clone of the genuine Fujifilm case for half the price. And then I came across something completely different. Something that seemed to match the character and caliber of the Fuji X100. A tiny operation out of Italy called Leicatime. A enthusiastic old man named Luigi hand makes each case. This is a truly artisan operation with classic leatherwork. Their products are well thought out and practically made to order. Unfortunately the same cannot be said for their website… But I think that actually adds something to the charm of these cases. There are a few different options for the X100 (and other X cameras). You can have your case in several colors including black or a few different shades of brown. The case can be configured in a simple half case or with a flip cover for the back. An additional cover can be had to entirely enclose the camera when not in use. And of course, an optional leather strap can be had to complete the whole package. I spent a few weeks lusting over these charming cases but couldn’t bring myself to pull the trigger. This brings me to the price… They’re not cheap. Not cheap at all. All of the prices on the Leicatime site are in Euros. The complete solution including the full case with rear flip cover, strap, and storage cover costs 320 Eruos which comes to about $370. Yes, you read that correct… I thought perhaps just the half case at approximately $250 would be a bit more practical, but I simply couldn’t bring myself to plunk down hundreds of dollars on one of these beautiful pieces. A few weeks later, I received a birthday present from my wife: the full kit in “Natural Aged Brown” finish, complete with rear flip cover, storage cover, and strap. I couldn’t have been happier or more impressed that she went through the trouble of navigating the confusing Leicatime website and transferring money to this tiny operation in Italy, hoping they would send the product she paid for. The rear flip cover, covers the entire rear of the camera leaving no unnecessary controls exposed. I find that this really encourages me to concentrate on the moment at hand. The front of the case is simple. It features a inlayed wooden grip that actually does give the camera a nice, solid feel. I usually don’t enjoy supplemental grips. 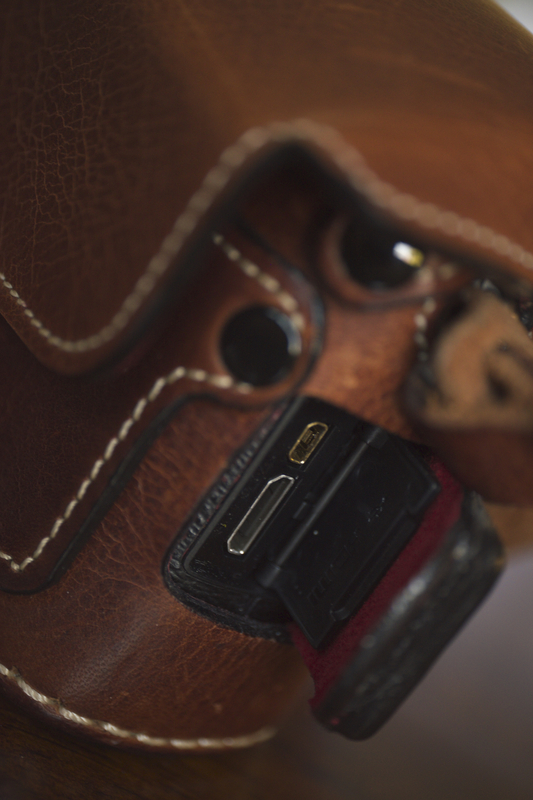 The case was very simple and straight forward to install, simply sliding over the bottom of the camera with two small “loop-around” straps of leather that kept the camera from sliding out. The rear flip cover has two small snaps that keep it held snugly in place. This rear cover was a great feature for me because it prevented unknowing people from asking to see the photo I just took. Subjects would ask to review a photo and I would simply show them the rear of the camera with a apologetic face, as if to say “sorry, there’s nothing to see here” without actually having to say anything. It also prevented me from chimping too often – something I actively try to avoid, only reviewing photos once I’ve returned home to my photo cove to “develop” the current “roll”. The rear cover folds down easily by releasing the two snaps on each side, exposing all of the controls on the rear of the camera and of course, the LCD screen. There are only two other openings in the case. One is a small window on the left side of the case that allows you to access the focus drive selector and the other is a flap that reveals the USB and HDMI ports on the right side of the camera. The case also features a bulging grip on the right side for additional ergonomics which I find quite helpful. The rear flip cover unsnapped revealing all of the rear controls and the LCD screen. The small flap on the right side of the camera conceals the USBB and HDMI ports. As beautiful as this genuine leather case is, there is one flaw that I can’t seem to get over. If you have ever used an X100, you’ll know that the SD card and battery door is located at the bottom of the camera. This means that you have to remove the entire camera from the case in order to extract the battery or SD card. I can live with this for the SD card since the USB port is easily accessible for quick and easy uploading to my hard drive. But I still need to remove the entire case in order to remove or swap the battery. It seems to me that a simple hatch or even a cutout would have been doable, but considering the amount of time, thought, and expertise, I trust that Luigi made the right decision in excluding such a feature. After all, he’s the leather camera case expert. Not me. I do like the front cover, especially when I want to simply grab the camera and throw it in a bag or onto the passenger seat of my car. But I generally leave remove it entirely and stash it in my bag or leave it behind since it can get in the way when swinging from the bottom of the camera. The strap is full y adjustable. I could set it at it’s maximum length and sling it over my shoulder, across my chest – or I can tighten it up a bit and position my camera around my neck in true tourist fashion. The underside of the camera. Notice a lack of access to the battery/SD card compartment. The complete kit including front shell for protected storage. Simple, and effective, the adjustable leather strap features Luigi Crescenzi’s signature stamp. Overall I’ve enjoyed this case from the moment I opened the box. It’s kept my X100 in absolutely perfect condition and I have no doubt that it’ll continue to do so. It’s elegance is complimentary to the beautiful Fujifilm camera and is just as usable as it is beautiful. I understand that this is rather expensive for a simple case and that much, much cheaper options will perform the same basic task of protecting your investment – but the Leicatime leather case is something different. It’s a work of art produced by a man who appreciates the finer things and takes pride in his work enough to stamp his name on every product he ships. I had this case for my X100 originally and swapped in the X100S when I got it which is what you see in the photos. The case worked perfectly fine with both camera models. However, I’m told that this particular case won’t work perfectly with the X100T, which I expect to have any day now. If I decide to order a new case for the X100T, I’ll likely go with the half-case with rear flip cover and exclude the full cover as I just don’t seem to use it as often as I expected to. Luigi has earned my loyalty with his beautiful craftsmanship and attention to detail. As the great Ferris Bueller once said, “If you have the means, I highly recommend picking one up”. Thank you! You helped make up my mind on which case.